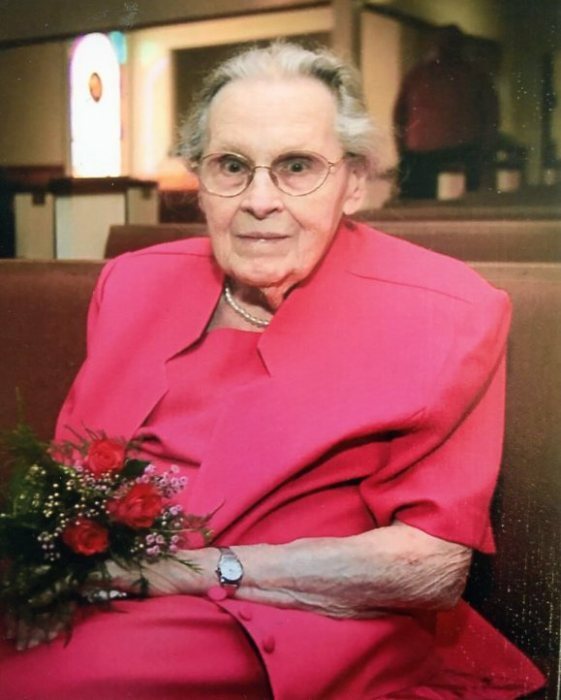 Coats, NC: Ms. Flonnie Etta Barnes, age 101, died Monday, March 25, 2019 at Dunn Senior Center. Funeral Service will be 3:00 PM, Thursday, March 28, 2019 at Rose and Graham Funeral Home in Coats. Revs. Randy Beasley and Keith Bonner will officiate. Burial will follow in Harnett Memorial Gardens, Lillington. Ms. Barnes was born March 7, 1918 in Harnett County to the late Thomas Hoshea and Zadia Etta Byrd Barnes. She was preceded in death by her brother, Purdie Barnes and sisters-in-law, Dorothy Barnes and Mildred S. Barnes. Mrs. Barnes was a homemaker. Surviving includes her brothers, James Garley Barnes of Garner; Hearley Barnes and wife, Blondell of Coats; nieces and nephews, Jenny Bowser of Cary, Ronald and Donna Barnes of Angier, Micheal and Bobbi Barnes of Garner, Cindy and Marshall McLamb of Benson; Darrell and Joanne Barnes of Norfolk, VA, Shelly and James Jackson of Apex, Jeremy Bowser of New Hill, Heather and James Godwin of Benson, Leigh Ann and Carson Walker of Benson, Matthew Barnes of Garner; several great nieces and nephews. The family will receive friends from 1:30PM to 2:30PM Thursday, March 28, 2019 at Rose and Graham Funeral Home in Coats and other times at the home of Hearley and Blondell Barnes 1944 Carson Gregory Road Angier, NC 27501. Flowers are welcomed: however, memorials may be made to Lee's Grove PFWB Church 6208 Fairground Road Dunn, NC 28334.